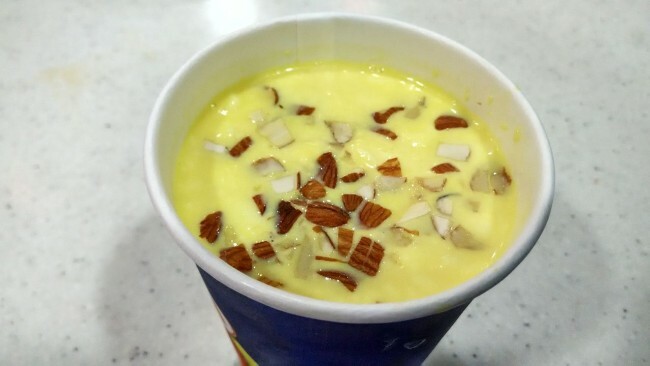 Kesar badam milk is sweet milk flavored with saffron and almonds. This power-packed energetic drink improves sharpness of the brain and thus makes for a healthy choice. The best thing about this drink is that it can be served hot or chilled according to season or choice. It’s good for the kids too. Put a pan with milk on medium heat to boil. Meanwhile take half of the almonds and pistachios in a blender jar, add little milk and grind to fine paste. Chop rest of the almonds and pistachios into thin pieces. When the milk starts boiling lower the heat and add the almond-pistachio paste into it. Continue to simmer for 10 minutes. Stir occasionally. Add sugar, cardamom powder, nutmeg powder, chopped almonds, pistachios and saffron to boiling milk and boil for few minutes more. Turn off the heat. Garnished with chopped almonds, cashews and pistachios and serve hot or chilled.